Honey is the substance made when the nectar and sweet deposits from plants are gathered, modified and stored in the honeycomb by honey bees. The definition of honey stipulates a pure product that does not allow for the addition of any other substance. This includes, but is not limited to, water or other sweeteners. 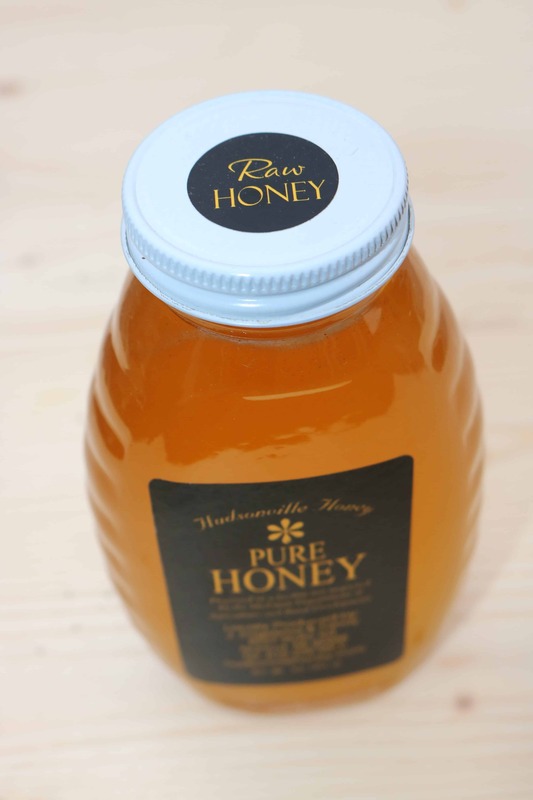 We bottle unheated and unfiltered honey into classic glass jars and label it as “raw honey”. Definition #1: Raw honey is honey as it exists in the beehive or as obtained by extraction, settling or straining without adding heat. So according to the National Honey Board, raw honey is simply honey that has not been heated or filtered. The only allowable processing would be to let it settle in a tank (e.g. any debris in the honey floats to the top) and honey is gated out of the bottom, or to remove larger non-honey particles such as wax and bee parts by straining it (e.g. a mesh material – not a fine filter). Definition #2: Raw honey is honey as it exists in the beehive or as obtained by extraction, settling or straining without adding heat that would exceed the temperature honey is subjected to while in the hive. The obvious question this definition provokes of course is just how hot does it get in a beehive? The answer to that question of course depends on which beekeeper you are talking to and where he/she lives! Some beekeepers will put this at 95°F (35°C) which corresponds to the approximate temperature the bees strive to maintain in their brood nest (even in the middle of the winter!). However, other beekeepers claim that a more realistic temperature is 118°F or even 120°F. I suppose if you live in Texas or Arizona, that’s not much of a stretch at all. Even on a muggy July day in Michigan, it sometimes feels at least that warm in the apiary! Another relevant question to ask is why is honey heated at all? Large scale honey packers (e.g. the ones that pack the honey on the shelves of your local chain grocery store) heat honey to much higher temperatures (e.g. approximately 145° F for 30 minutes or more) for a variety of reasons. They need to blend large amounts of honey from a variety of sources so that the honey has a consistent color and flavor. The heat also makes it possible to pass it through a much finer filter which improves the clarity. Finally, once heated to a higher temperature the honey will stay in liquid form much longer, and delay crystallization (yes – all pure honey will eventually crystallize). These are all desirable side effects for the larger grocery chain that buys and sells honey in high volume, but not necessarily desirable for you the consumer. Go ahead and try some honey from your local small beekeeper and see how it compares to the “honey” you purchased from the large chain grocery store. So what about the honey we sell? From a labeling perspective we stick to the more conservative (and less ambiguous) definition of raw honey provided by the National Honey Board (see definition #1 above). We bottle unheated, unfiltered honey directly into classic glass queenline 1 and 2lb jars. These jars have wide mouths on them, as inevitably by the time it reaches you it will be partially or totally crystallized. The wide mouth facilitates scooping the honey out with a spoon, which is what you will need to do if you absolutely want to avoid applying any heat. These are the only products we label as “raw honey”. The honey we sell in plastic containers (squeeze bottles, etc) is warmed temporarily, just long enough to melt the crystals, but not over approximately 105°F. Most beekeepers and consumers still consider this “raw honey”. So while it meets the second definition for raw honey above, we do not label it as raw honey. We prefer to make a distinction between honey we subject to no heat at all, and honey that we warm enough to make sure its liquid (its kind of hard to get crystallized honey out of a squeeze bear!!). With this approach, you the consumer get to decide which definition for raw honey you prefer, so you can purchase the product that best fits your personal preferences. Extreme “raw honey” – honey sold in the comb! The cut edges are allowed to “drain” over night, before packaging. 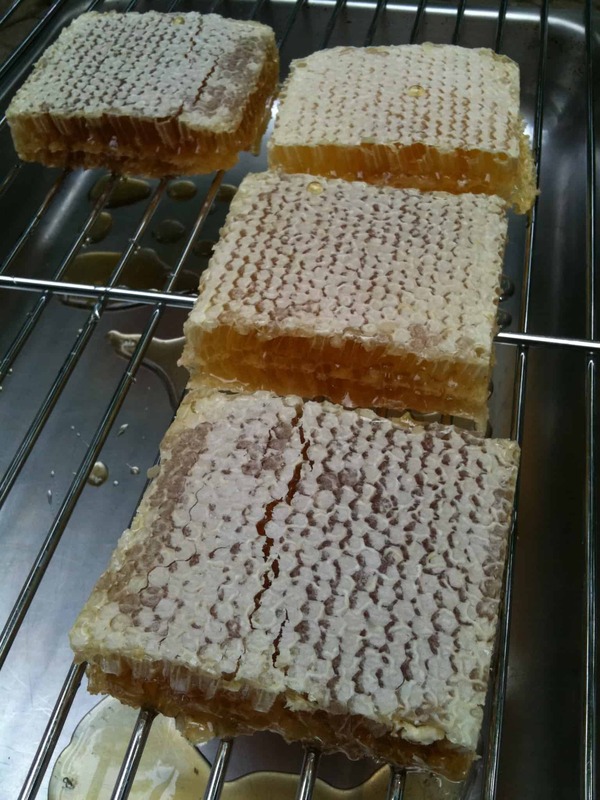 It’s also worth pointing out that we also sell limited amounts of comb honey in season. Comb honey is just that – honey that is still in the comb where the bees placed it! We basically cut square sections out of frames of honey from the hive into 8-12oz chunks and place in a leak proof container. The bees wax is completely edible, so you can spoon the comb honey into your tea, oatmeal, yogurt or simply eat it by the spoonful (as our kids like to do). This kind of raw honey trumps all other definitions of raw honey! If you haven’t ever tried comb honey, you should. The problem is that its more difficult to produce, and many beekeepers don’t bother trying. Nevertheless, if you keep an eye open at your local farmer’s market during the summer months, you just might find a vendor selling it. We usually have some available during August – October, but normally sell out fairly quickly. Bill, what do you mean by “separated”? If it is crystalized that is totally normal. It doesn’t matter if your honey has not been heated, if it is pure honey it should be fine no matter how long it has been on your shelf. Heating simply delays crystallization and makes it possible for the honey packer to fine filter it. Your site is too good with much useful information even for Foreign people.Could I share these with my customers too?